Contemporary luxury in old Cotswolds chapel - Stunning valley views. 4 bedrooms. The Old Chapel is a unique Cotswolds family holiday home, sleeping up to 10 (maximum 8 adults) in four bedrooms. This beautiful, self-catering accommodation is set on the steep slopes of the Slad Valley, in the heart of the Cotswold Hills, one of the most picturesque and unspoiled locations in England. Described by The Guardian newspaper as 'one of the best cool holiday self-catering accommodations in the Cotswolds...it's both homely and stylish,' The Old Chapel was also awarded 'Best Unique Property' by Unique Holiday Cottages. The hamlet of Slad, immortalised by Laurie Lee in his famous novel 'Cider with Rosie', boasts stunning views, a choice of great walks and one of the best pubs in the Cotswolds – The Woolpack. The converted chapel, built in 1865 and thoroughly renovated a few years ago, provides contemporary, stylish and very comfortable holiday accommodation. Home comforts include a large and very well equipped kitchen-dining room, a huge open-plan living space with wood-burning stove, and separate TV areas for you and the kids. With a wonderfully quirky graveyard in the garden the Old Chapel is a long way from your usual self catering Cotswolds holiday cottage.The furniture is a mix of antique, retro and contemporary, and is ideal for two families to share. The owners continuously maintain the Old Chapel to a high standard. Surrounded by wild flowered meadows, ancient woodland and rolling hills, with breath-taking views and walks directly from the front door, this is an ideal self-catering base for Gloucestershire walking holidays, and is well-positioned for visiting other parts of the Cotswolds, and towns such as Bath and Cirencester. It is available for long weekends, weekly rentals or longer breaks. The Old Chapel is not your average Cotswolds cottage (no low ceilings, no cramped living space). It's a large, unique, stylish family holiday home with wonderful views inside and out. Completely up to date bathrooms with power showers, stylish, high quality fittings and contemporary decor. Sorry, this is not a party house - strictly no stag or hen nights and no smoking. The kitchen is very well equipped and ideal for cooks - plenty of up to date utensils, cookbooks etc Good sized gardens back onto open meadows and woodland beyond. Large, wrap-round terrace overlooks the graveyard across the valley on one side and the garden on the other. Equipped with garden furniture and barbecue. Large enclosed trampoline. Parking - off-road space for up to four cars. Gated entrance. The property is not overlooked. Central heating, electricity and firewood are included in the rental price. Free wireless internet access. Freshly laundered linen and towels included in the rental and are changed weekly. For two week stays, the house will be cleaned and linen / towels replaced on the Friday at the end of the first week. My family (myself and my spouse, our two young boys, and my parents) stayed at the Old Chapel during the last week of May, 2018, while on holiday to celebrate my father’s birthday and my parents’ anniversary. It was a magical home-away-from-home, and we had a wonderful time. The Old Chapel is a place of stunning beauty, inside and out. We happened to stay during the height of springtime, so were there to witness the superabundance of flowers that envelope the property this time of year — wisteria, lilac, roses, honeysuckles; sitting in the gardens was a heady experience. Indoors, the converted space is impeccably styled with eclectic and whimsical taste, and is a perfectly comfortable place for family relaxation — every detail has been considered for the comfort of guests. The rooms are airy and bright, some lit by the church’s original rosette-windows; wonderful beds with with sumptuous bedding; the bathrooms are modern and have good water-pressure. The kitchen is outstanding — an enormous, beautifully designed space equipped with every tool you need to produce a restaurant-quality feast. Overall, the atmosphere is calm and cheerful, with new details of decoration and design to catch the eye at every glance (art-lovers are in for a special treat). All of this, and I haven’t yet mentioned the bucolic views of the sheep-dotted hills and hedgerows to be met in every direction, the immediate proximity to the various places of literary renown around the village of Slad (thanks to local author Laurie Lee’s memoirs), and the Woolpack pub less than 5 minutes down the road… it would be hard to create a more perfect place to stay while visiting the Cotswolds, or anywhere else. Thank you so much for the lovely review and I am delighted that you all enjoyed your time relaxing at the Old Chapel. We look forward to welcoming you all back one day. The Old Chapel in Slad is a fantastic holiday home. We arrived with the family on Friday and loved every minute of our weekend. The house is beautifully positioned with a great outdoor space. The inside is beautifully kept and decorated and well stocked for all of our needs. There are lovely walks on the doorstep and the Woolpack pub just down the road is certainly worth a visit. Stroud town is only a 5 minute drive and the farmer market on Saturday was well worth visiting. Would recommend to anyone who loves this area of the Cotswolds. We are so pleased you had a great time, thank you. 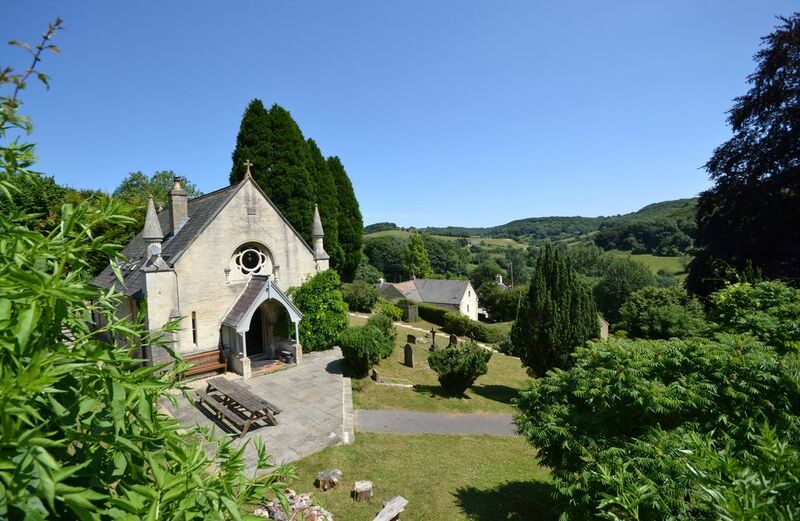 absolutely perfect holiday getaway- beautiful, comfortable, peaceful chapel conversion! We have been fortunate to stay in many wonderful self catering cottages and houses over the years- The Old Chapel is my favourite of all time! This place is more than a self catering cottage, it feels like stepping into HOME. Wonderfully designed and decorated, with everything you could ever wish for in a vacation spot- kitchen gear, books, walks, art work, garden area, views, the perfect local pub around the corner-everything you need is here! This is a truly special property, and we are fortunate that is is being shared as a self catering rental! we will return time and time again! Thank you, we are so glad you had a wonderful time. We will look forward welcoming you again. Fantastic house and lovely surroundings! Here in the South-West Cotswolds the area has a slightly wilder nature, especially in the five beautiful valleys around Stroud, of which Slad Valley is considered the most unspoiled. These are the real Cotswold Hills; nature reserves, meadows, wild orchids, steep climbs and wonderful views, away from the crowds of tourists you find in north Gloucestershire. Two miles away is Painswick, 'Queen of the Cotswolds', one of many beautiful villages in the area. The Rococo Garden is a must, and you have a choice of stunning mansions, abbeys and castles within a short drive. Closer to home - a 2 minute walk away - is the famous Woolpack Inn, a timeless pub that serves fantastic food and ales and one of the best views you can imagine. Nearby Stroud has an award-winning farmers' market on Saturdays, and swimming, cinema and bowling to keep children happy. Other Activities: horse riding, golf, hiking, country pubs, gliding, shooting, dry-slope skiing. Weekly rentals are normally Fri to Fri though we can be flexible. Arrival from 4pm, and we ask you to vacate by 10.00am on your final day. Standard 3 night weekend breaks start on Friday and cost 75% of the weekly rate. 4 night breaks start on Monday and cost 70% of the weekly rate 5+ night break costs the full weekly rate. Sunday arrivals/departures not accommodated. 25% deposit with the balance 6/8 weeks prior to your stay with a £350 returnable deposit.